An updated board has been placed at the cemetery and the following is a comprehensive list of people buried here, also some farm burials. 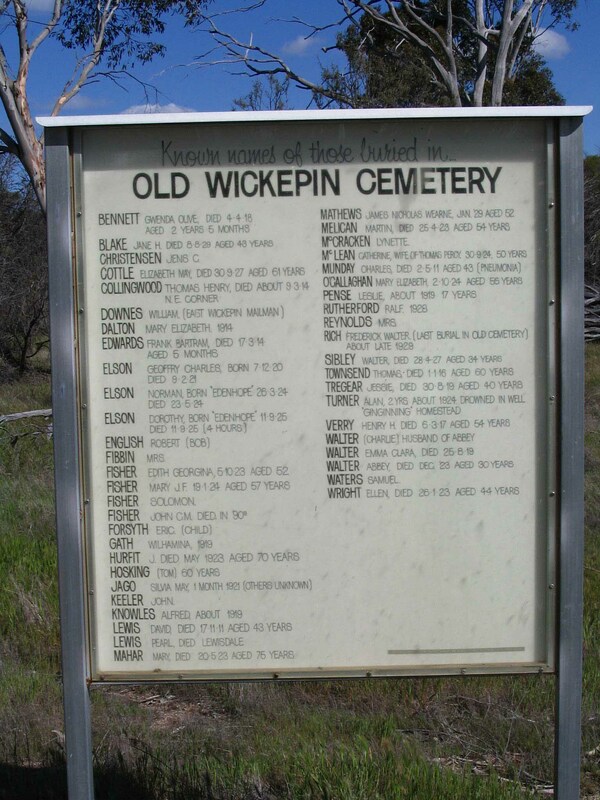 Click HERE for a photo of the original board that was at the cemetery. ARMSTRONG, Infant Male, unnamed. 23 August 1922. BAILEY, Infant. 6 April 1928. Stillborn. BEDFORD, Chrissie. 22 June 1919 aged 24 hours. BENNETT, Gwenda Olive Muriel. 4 August 1918 aged 2 5/12 years. BESWARRICK, Joseph. 21 September 1911 aged 42 years. BISHOP, Jack. 17 June 1927 aged 18 years. BLAKE, Jane Harris. 8 August 1929 aged 43 years. BROWN, 1 March 1927 aged 18 months. BUTLER, Eric Ronald. 21 June 1929 aged 6 years. CALDWELL, John. 28 March 1914 aged 52 years. CLAYTON, Ernest Roy. 14 November 1908 aged 15 years. COYLE, Harold. 9 July 1914 aged 30 hours. CURTAIN, Patrick. 7 August 1922 aged 55 years. DART, Maurice. 29 September 1915 aged 8 weeks. DAVINE, John. 21 April 1917 aged 61 years. DINSDALE, Roy 15 December 1926 aged 1 hour. DOWNIE, Maude Matilda. 21 February 1927 aged 8 years. EDWARDS, Frank Bartram. 17 March 1927 aged 5 mths. ELSON, Dorothy. 11 September 1925 aged 4 hrs. Born 'Edenhope'. ENGLISH,Margaret. 4 December 1927 aged 59 years. FISHER, Edith Georgina. 5 October 1923 aged 52 years. FISHER, Elizabeth Maria. 21 June 1926 aged 59 years. FISHER, Emma Pickis. 14 May 1910 aged 70 years. FISHER, John Cowley Morgan. 20 January 1913 aged 81 years. FISHER, Margaret Claire. 23 March 1929 aged 7 weeks. FISHER, Mary Jane F. 18 January 1924 aged 57 years. FLEMING, Henry Albert. 17 May 1919 aged 43 years. FORMAN, Infant. 118 August 1927, stillborn. FORSYTH, Eric Charles.24 September 1920 aged 3 years. FRANCIS, Joseph Lionel. 3 June 1913 aged 7 months. GALLIERS, Lillian. 6 July 1925, stillborn. GATH, Wilhelmina. 30 August 1919 aged 51 years. GLASSETT, James. 8 March 1916 aged 74 years. GLASSETT, William James. 22 February 1916 aged 10 years. GRAY, Alice. 11 July 1928, hours. GREEN, Alfred. 7 June 1926 aged 50 years. GREEN, Infant female. 5 November 1921. HALL, Ethel Jane. 28 September 1908 aged 22 years. HANNINGTON, David Lyndsay Stewart. 17 June 1910 aged 38 years. HAYS, Julia. 25 April 1926 aged 54 years. HEMLEY, Florence Preston. 12 October 1906 aged 5 years. HEWITT, Jack. 24 July 1921 aged 6 years. HOSKEN, Infant female. 14 May 1922. HOVELL, Robin Bexford. 18 January 1927 aged 9 days. HOVELL, Infant female. 12 May 1922. HOYLE. Infant male. 20 May 1922. HUME, Levi. 10 March 1911 aged 75 years. HURFITT, Jane Brown.5 May 1923 aged 70 years. JAGO, Sylvia May.26 December 1921 aged 5 weeks. JAGO, William Jack. 28 November 1924 aged 1 day. JOYNES, George. 10 April 1915 aged 67 years. JOHNSON, George John. 7 May 1914 aged 3 months. KEELER, Reginald John.23 June 1927 aged 39 years. LANGE, Shiela Arnold. 13 May 1913 aged 1 year. LATHAM, Winifred Grace. 20 January 1920, stillborn. LONG, Alice. 23 November 1921 aged 40 years. LOWKE, Shiela Daphne. 7 November 1923, stillborn. MAHAR, Albert John. 19 March 1929 aged 16 years. MAHAR, Leslie Martin. 23 September 1928 aged 9 months. MAHAR, Mary. 21 May 1923 aged 77 years. MALONEY, Johanna Mary. 16 September 1919 aged 45 years. MAREY, Ellen. 14 September 1914 aged 72 years. MATTHEWS, James Nicholas Wearne.6 January 1929 aged 51 years. MCCALL, Dorothy. 8 May 1928 aged 6 days. MCCALLUM, Wilfred George. 6 June 1921 aged 10 months. MCCRACKAN, Elizabeth Ann. 16 July 1914 aged 39 years. MCCROREY, Evelyn Marie. 6 November 1914 aged 8 days. MCCROREY, Mary. 28 September 1911 aged 36 hours. MCLEAN, Catherine. 30 September 1924 aged 50 years. Wife of Thomas Percy, Mother of Margaret Jean. MELICAN, Martin. 25 August 1923 aged 54 years. MILL, William. 17 October 1911 aged 46 years. MOFFAT, Thomas. 10 May 1923 aged 49 years. MORTIMER, Alfred George. 17 October 1922 aged 49 years. MUSTY, Hope John. 6 October 1927 aged 52 years. NEVILLE, Arthur Leslie. 15 May 1915 aged 2 years. NOBLE, David William. 30 October 1916 aged 21 days. NOBLE, Kathleen. 24 October 1910, stillborn. buried Boyning. NIX, Rose. 5 January 1924 aged 9 days. O'CALLAGHAN, Mary Elizabeth. 2 October 1924 aged 56 years. PAULEY, Elizabeth Mary. 13 April 1912 aged 9 hours. PEAKE, Sarah. 27 September 1912 aged 79 years. PENSE, Leslie Leach. 10 September 1920 aged 18 years. PHILLIPS, James. 24 January 1927, stillborn. PHILLIPS, Lillian Mary. 7 February 1927 aged 30 years. QUICK, Ellen. 15 January 1918 aged 87 years. RAHALEY, Jeremiah James. 8 August 1925 aged 52 years. RAILLY, John. 14 November 1929 aged 60 years. REID, William Anderson. 3 August 1926 aged 21 years. RETALLACK, Infant. 3 October 1924, stillborn. RIDLEY, George Henry. 2 July 1923, stillborn. RIDLEY, Henry. 19 June 1922 aged 20 minutes. RIDLEY, Sarah. 14 April 1914 aged 62 years. RUTHERFORD, Ralph.26 September 1928 aged 69 years. SCALLY, John. 4 September 1926 aged 1 day. SCHULTZ, John William. 14 October 1925 aged 52 years. SHIPLEY, George. 17 November 1914 aged 30 hours. SIBLEY, Walter Wilmot. 28 April 1927 aged 33 years. Husband of Ida. Father of Clarrie, George, Eric. Pioneer Stretton Area 1911-1927, Avon Loc 17170. SMITH, Thomas Martin. 13 May 1922 aged 2 years. SNOW, Bernard. 29 August 1899 aged 4 hours. Buried B Ashton's farm. SNOW, Cecil. 8 February 1903 aged 5 days. Buried B Ashton's farm. SNOW, Cyril. 3 February 1903 aged 1 hour. Buried B Ashton's farm. STAFFORD, Robert James. 25 February 1924 aged 57 years. THOM, John Alexander. 17 September 1922 aged 75 years. THOMAS, Richard. 7 April 1922 agd 49 years. TOWNSEND, Thomas.1 January 1916 age 60 years. Husband of Lydia. Father. TROUNCE, Humphrey Percival. 18 January 1916 aged 27 years. TURNER, Allan Thomas. 8 October 1925 aged 14 months. VERRY, Henry Herbert. 6 March 1917 aged 54 years. Husband of Caroline. VIRGIN, Thelma Beatrice. 28 September 1922 aged 9 days. WALKER, Robert. 26 April 1912 aged 49 years. WALL, John Edwin James. 4 April 1927, stillborn. WALTER, Abbey. 22 December 1924 aged 30 years. Wife of Charles. WALTER, Emma Clara. 25 Aug 1919 aged 17 years. WALTER, Infant male. 22 December 1924. WARNER, Mary Jane. 28 March 1928 aged 75 years. WATTERS, Harry Charles. 8 November 1924 aged 16 days. WATTERS, Samuel Richard. 27 May 1917 aged 31 years. WATTS, Infant male. 11 April 1923. WILSON, Charles. 8 November 1911 aged 1 day. WINDYTCH, Mickey. 7 April 1919 aged 17 years. WORRALL, Fred. 14 October 1929 aged 48 years. WRIGHT, Ellen. 26 January 1923 aged 44 years. WRIGHT, Infant female. 23 January 1923. WULF, Hans Jacob. 7 September 1929 aged 28 years.